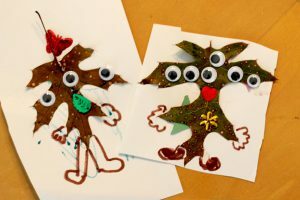 Find a great leaf, glue it to paper, add googly eyes and draw in hands and feet. This is great for fine motor skills, sequencing tasks, visual processing skills, and body awareness. Tah dah! 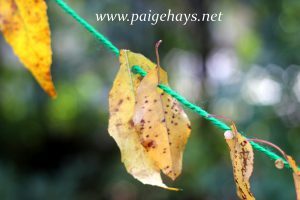 Collect colorful leaves and hole punch the, then string them up and decorate outside. 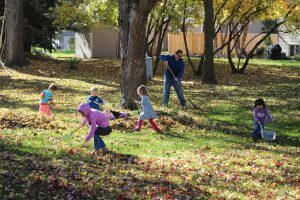 Using a hole punch build hand strength while stringing the leaves works on fine motor and visual-motor coordination skills. 3. Make a leaf angel. Lay down, open/close arms and legs. 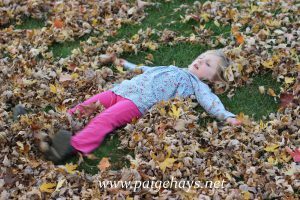 Great for sensory exploration of grass and leaves, as well as bilateral coordination with arms and legs (using two sides of the body together).